Welcome back to Quinn’s Pointe. In the quiet streets of this master-planned community, new and growing families can put down roots and build new traditions. Live a stone’s throw away from the urban amenities you need, while enjoying your neighbourly community and a close connection to the great outdoors with new parks and green spaces. 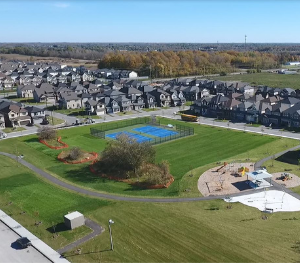 Your favourite Minto Communities’ Single Family Homes and Townhomes designs, mark the return of Quinn’s Pointe to Barrhaven South, on sale now. 30', 36', and 43' Single Family Homes for sale in Barrhaven South, Ottawa. 2-Storey Executive and Avenue Townhomes for sale in Barrhaven South. Quinn's Pointe is ideally located close to all of Barrhaven's amenities. The choice is yours in Quinn’s Pointe. Explore the collection of expertly designed homes available in Phase 2 of this master-planned community. Stay close to untouched rural surrounds, all while being just minutes from all of Barrhaven’s most popular amenities. Find out what exciting community features to expect in Phase 2 of Quinn’s Pointe. Welcome back to Quinn’s Pointe. Here’s all you need to know about the exciting new community features which mark the return of the community.